Ireland’s undefeated, No. 1 mandatory world junior featherweight contender T.J. “The Power” Doheny (18-0, 13 KOs) will put his record and status on the line this Saturday (Mar. 17) in the eight-round co-featured event on the “St. Patrick’s Day Clash 3” Pay-Per-View, card, also airing in Canada exclusively on Super Channel, live from the House of Blues in Boston. 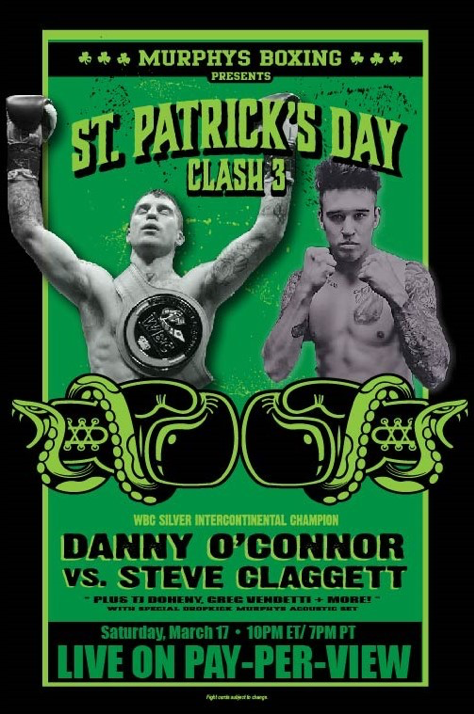 Local fan favorite, Irish-American Danny “Bhoy” O’Connor (29-3, 11 KOs), fighting out of nearby Framingham, MA, will make his first World Boxing Council (WBC) Silver International junior welterweight title defense against Canadian challenger Steve “The Dragon” Claggett (26-4-1, 17 KOs) . “St. Patrick’s Day Clash 3”, starting at 10 p.m. ET / 7 p.m. PT, is presented by Murphys Boxing in association with Joe DeGuardia’s Star Boxing. The popular Dropkick Murphys will play a live acoustic set prior to the main event. Preceding the PPV fights, 8-10 p.m. ET / 5-7 PT, four undercard bouts will be available to watch live and for free on FACEBOOK FIGHT NIGHT. co-featured event. A southpaw like Doheny, Oliver is a familiar figure in Boston having been a five-time New England Golden Gloves champion. Doheny is a native of Ireland, who has lived in Australia, but he recently resettled in Boston’s predominantly Irish section of Dorchester. He is a five-time Irish National Champion who has more than 150 amateur matches, including a victory over Belfast’s Carl “The Jackal” Frampton (26-1, 14 KOs), who is a two-division world champion as a professional fighter. Last December, Doheny traveled to Bankok to fight Thai favorite Pipat Chaiporn (44-10-1) in a International Boxing Federation (IBF) eliminator to determine the No. 1, mandatory contender for IBF world champion Kenichi Ogawa (23-1, 17 KOs), of Japan. Doheny emerged with a win by12-round split decision (117-11, 116-112, 113-115). Against Oliver, Doheny will be risking his undefeated record and IBF No. 1 contender rating, but Ogawa is also a veteran southpaw like Oliver, who is viewed by Murphys Boxing and Team Doheny as a good opponent to better prepare Doheny for Ojawa. O’Connor (29-3, 11 KOs), who was a 2008 U.S. Olympic Team alternate, as well as the 2008 National Golden Gloves and US Future Stars champion as an amateur, is coming off a third-round knockout of previously unbeaten Daniel Gonzalez (14-0-1) for the vacant WBC Silver Intercontinental crown last November at Mohegan Sun Casino in Connecticut. Calgary-native Claggett (26-4-1, 17 KOs) hit the road last October and upset previously undefeated Yves Ulysse, Jr. (14-0) in his backyard for the vacant International Boxing Federation (IBF) North American super lightweight title. Neither Claggett’s IBF North American nor his NABA USA title will be at stake versus O’Connor. Top New England prospects, “The Silent Assassin” William Foster III (6-0, 6-0 (5 KOs) and Irvin Gonzalez, will be showcased in a pair of six-round matches. Foster, a lightweight from New Haven, CT, faces former WBC International bantamweight champion Nick “Kanyankole” Otieno (31-13, 13 KOs)., Reigning UBF All-American super featherweight champion Gonzalez, of Worcester, MA, takes on a fellow unbeaten featherweight prospect, Ugandan Sulaiman Segawa (9-0, 3 KOs). On Facebook Fight Night, New England champion Greg “The Villain” Vendetta (17-2-1, 10 KOs), Stoneham, MA, vs. Engleberto Valenzuela (11-12, 3 KOs), Mexico, 6 rounds; Russian welterweight Yurik Mamadov (6-1, 3 KOs), Brooklyn, NY, vs. Daniel Sostre (13-16-1, 5 KOs), Puerto Rico, 6 rounds; featherweight Amanda Pavone (2-0, 1 KO), Burlington, MA vs. Sarah Click (pro debut), Framingham, MA, 4 rounds; lightweight Tomas Romain (5-1), NY vs. Israel Rojas (13-20, 5 KOs), Mexico, 6 rounds.